2001: I began blogging (using my own software). I subsequently moved my blog to diaryland where I met DiscoDave, now my Other Half (although that happened much later). I also began meeting up with Copenhagen-based bloggers. We weren't all that many in those days and could fit our Xmas party into a small flat. 2002-4: I moved the blog to blogspot. My blogging became less about my hazy university social life and more about academia and books. A lot about books. 2004- 2006: I bough my own domain, bookish.dk, and turned my blog into a fullblown litblog. Heady days with publishers emailing me with lovely offers, getting linked by major US & UK newspapers, appearing on the radio and all that. I also gained a bonafide stalker in the process who had to be cautioned by Copenhagen police whilst I hid in my best friend's flat. That wasn't fun nor heady. 2007: My webhosting company pulled the plug on bookish.dk for no apparent reason (this happened to several other bloggers too). I set up this very blog instead after mulling over it for a few months. I missed writing way too much. 2008-? : Lit-blogging gave way to personal blogging gave way to craft-blogging. 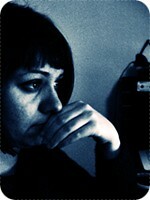 As a result I now show my face on the blog (and if you are a bit savvy, you can find my full name too). Blogging is now so mainstream that most of my offline friends are linkable. Social networking has become very intertwined with blogging and it is sometimes difficult to know when my blogging starts and ends (for more thoughts on this, I recommend reading Stuart's take). Simply put: I cannot imagine the last decade without blogging and bloggers. Over the past ten years I have met a huge amount of clever, funny, witty people (and my boyfriend) through blogging. Some of you I have later met offline; some of you remain online friends. I won't do a rollcall because I will miss out too many people - and some of them have left the blogosphere too - but thank you to each and every one of you. It has been a real blast. Can I make a simple request? If you happen to read this, would you leave a comment? You can say something about how you feel about blogging, if you blog (why (not)? ), what your favourite blogs are .. anything goes. I would just like to hear from you - even you, dear lurking blog reader! And here's to ten more years.